The northe rn mountainous province of Yen Bai will hold a culture, sports and tourism week highlighting terraced fields in Mu Cang Chai district from September 26-29 to mark 55 years since President Ho Chi Minh visited the province. The event offers a chance for ethnic groups in Mu Cang Chai in particular and Yen Bai province in general to look back on their revolutionary tradition and heroic spirit during struggles against the French colonists and American imperialists. 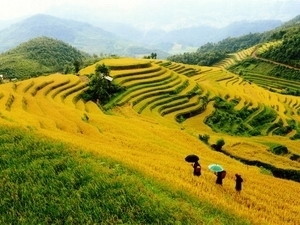 It also aims to promote Mu Cang Chai terraced field, recognised as a national scenic site, as well as the unique cultural identities of the Mong ethnic group to both domestic and foreign tourists. A string of activities will be held, including a sport festival, a photo exhibition themed “Mu Cang Chai – golden stairs”, a mountainous market, and contests of making Day cake (round cake from glutinous rice) and rice field ploughing. Tours to the district’s communes will be offered during the event. The fields are visible from virtually everywhere in the district as they expand over 2,200ha, including around 500ha in Che Cu Nha, La Pan Tan and De Xu Phinh communes. The terraced fields in these villages were recognised as a national heritage in 2007 by the Ministry of Culture, Sports and Tourism. Rice fields are not only a source of food and income for the Mong; they are an intrinsic part of their culture and of Mu Cang Chai, which is itself a quiet district on the bank of the Nam River.